I just bought a new hood and light for my fish tank, and I think for the first time ever, I’m not happy with it. Actually, this is the second time I’ve been unhappy with a hood and a light (why else would I be buying a new one?). My current tank is a 20 gallon tall tank with a nice matching stand. It is a sort of light color and even though I prefer black for fish tanks, it looks good (and Beth already had it which is a big plus). Unfortunately, the top was never very good. It doesn’t cover the full top of the tank so it always seemed like the light was in danger of falling in. As for the light itself, the plastic on the inside was crumbling and disintegrating which is something I have never seen before and I’ve had some pretty old aquarium equipment. So, I finally found a hood and light at PetSmart that matched the color of the tank and stand. 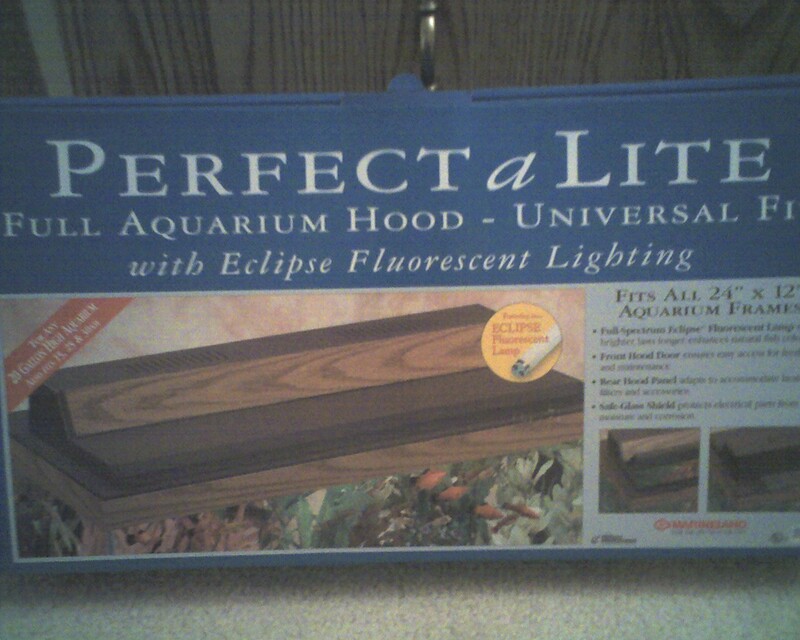 The Perfect a Lite Full Aquarium Hood with an Eclipse light(pictured below). Cost me over thirty dollars and I am not happy. I have had aquariums nearly my entire life, and I’ve never seen a hood like this. Do not buy one of these if you have the choice. After cleaning it, I tried to put the hood on the tank, and much to my surprise, it didn’t fit. It turns out there are a hell of a lot of little plastic pegs that you need to break off to make this fit properly. Of course you have to choose just the right ones for your tank after which it won’t fit other tanks properly. All of which is very odd since I though tanks were pretty much standard. To make matter worse, the plastic pegs don’t break off cleanly so it still wouldn’t fit. I had to use a razor blade to smooth it out. And it still doesn’t fit all that well. Not nearly as nice a fit (which is fine functionally, but aquariums are at least fifty percent about aesthetics) as older (black) hoods I have. Getting past that, the light came with the worst bulb I’ve ever seen. It gave the entire tank a sickly green cast. I had to take the fairly old bulb out of my old light and use that (an AQUA-GLO brand bulb that gives a very pleasing natural, but almost purple glow). So this means that effectively, this cost me even more than what I paid since I had to throw out the new bulb that came with it and replace it. 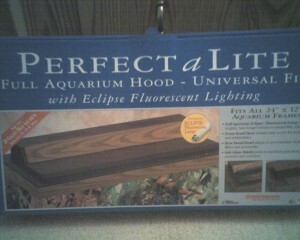 This was all pretty disappointing since I usually really like getting new aquarium stuff. I need to replace most of my (plastic) plants, but at least that should be a bit more painless. Comments Off on Why does he do it? Why does the cat seem to feel the need to throw up on the comforter every time I clean it? He doesn’t normally throw up on it. And I don’t exactly clean the comforter every day, so it spends most of its time not near a cleaning. So it doesn’t seem like a coincidence. But it is very annoying.